The rift between the day-to-day operations and strategic goals can sometimes be too wide for managers to have any KPI buy-in at all. Let’s get real: the only way anyone will buy in to anything is if they believe it can help them do what they’re currently trying to do. Middle and frontline managers are busy managing. Managing people. Managing processes. Managing problems. When the corporate people come down from head office and ask them to start reporting KPIs, the lack of buy-in should be no surprise. That’s because there is a rift between what managers focus on, and what corporate people focus on. If we want operationally-focused managers to align their results and to corporate strategy and take KPIs seriously, we need to bridge the rift. And there are several practical ways we can do this. Ask them what they believe they’re contributing to. Often managers are too busy in the weeds to look up and see the field. A good warm up to increasing their KPI buy-in is to simply check with them what they believe the bigger results are that their teams contribute to. Asking them is often more engaging than telling them. Asking them starts a dialogue. Telling them shuts down any chance of dialogue. Ask them how they do that contributing. Managers know that they can’t directly achieve the strategic goals of the organisation. But asking them how they contribute can be too open-ended a question. Instead, ask them what their business processes are. Ask them what the outputs and outcomes are that come from these processes. Ask them how these outputs and outcomes make it possible for the organisation to fulfil its mission, reach for its vision and achieve its strategic goals. Make the link between operational results and strategic results visual and clear. Strategy maps are so popular because of their visual simplicity in showing how different results relate to one another. Results Maps are similar, but they show how results from different levels in an organisation relate to one another. And this powerfully shows what each manager’s team has ownership of, and how it fits into the whole. Insist that KPIs are tools for them, not more stuff to report to senior managers. I say it as often as I can: KPIs are tools in our hands, not rods for our backs. KPIs do their best work when managers can use them to analyse and improve the processes they own. 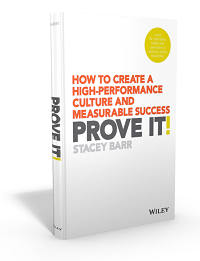 KPIs do their worst work when leaders use them to judge the performance of the managers. So encourage managers to create KPIs that help them improve operations, improve their processes, improve the outputs and outcomes of those processes. They shouldn’t have to “report up” the KPIs. Rather, they participate in conversations about how their KPI results correlate to the strategic KPI results. Talk about a new definition of accountability. We all want managers and employees to be accountable for performance. But we virtually never explain what this exactly means. What does it look like? How does it work in practice? We need a definition of accountability that encourages managers to improve performance, not manipulate it. Invite managers to feel accountable for monitoring the right results, interpreting measures of those results validly, and taking improvement action only when it’s needed. Give managers a practical method to create the right KPIs. 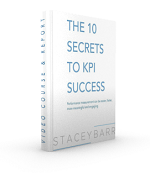 No-one is born with the innate ability to create great KPIs. In fact, no-one ever really gets the opportunity to learn how to create great KPIs in most management training, either. So give them an approach that works. Like PuMP. If we want managers to take KPIs seriously, we need to bridge the rift between operational and strategic results. Do managers in your organisation buy in to KPIs? If not, what’s stopping them? The KPI measure-up is a very good one at my workplace, especially in planning out projects and implementations. I haven’t taken the PuMP Blueprint yet but I am looking forward to doing so. One of the issues is whether I take it myself or involve everyone. I am thinking both might be what happens (certainly the latter). I have been struggling with the whole idea of creating buy-in for evidenced-based management generally. Although I understand this is one of the key elements of PuMP, for me, the issue is how get buy-in for PuMP? I love your definition of accountability (monitoring performance + interpreting performance + initiating action). In our organization I’ve managed to get Executive buy-in for understanding it is all about processes, not people. To me the next pebble (I think) will be to engender an appreciation for the value of and need for monitoring and understanding processes (especially with respect to tools like Smart Charts). I’m trying this approach because I actually want to avoid talking about bad habits. I’d much rather the focus be on the good news about the great tools available to monitor and analyze processes, leading in to how it’s all about process improvement.From here, the natural progression will be to ensure we have well-defined ways to measure processes. (Enter PuMP). Bill your desire to focus on good news is certainly a good thing. What I’ve learned though, is it’s super hard to get people to see why your good news (or the PuMP good news) is any better than what they’re already used to. Most people don’t see the struggles with performance measurement, they’re so used to feeling them. So talking about the bad KPI habits is only a short conversation, but it starts from where they are by describing reality in a way they haven’t thought about it before. It gives them the motivation to open up to new ideas (and to see the relevance of your good news).